Lee.org » Blog Archive » We’re on TV!! This is a robot. Well, actually a roll-bot. It doesn’t even have wheels. It just sort of rolls along. But then it’s not supposed to do much. This robot was born to dance. At the bottom of the sphere you will see something swinging back and forth. That’s a very heavy battery. By shifting it backward or forward like a pendulum you can force the cage to roll backward or forward, even change direction. On top is a black radome connected to an inexpensive wireless network called Zigbee, connected to a laptop which is connected to a common video game controller. But wait, there’s more. Michael Prados, Lee Sonko and a small team developed this for the art festival in the desert, Burning Man 2007. They are busy fashioning aluminum ribs and electronics for five more robots which will all become dance partners; because the black dome atop the robot contains a GPS unit in addition to wifi. So a half dozen robots will be able to talk to each other and synchronize their dance without needing the remote control. At least that’s the plan. With the next roll in bots, Richard Hart, ABC Seven News. 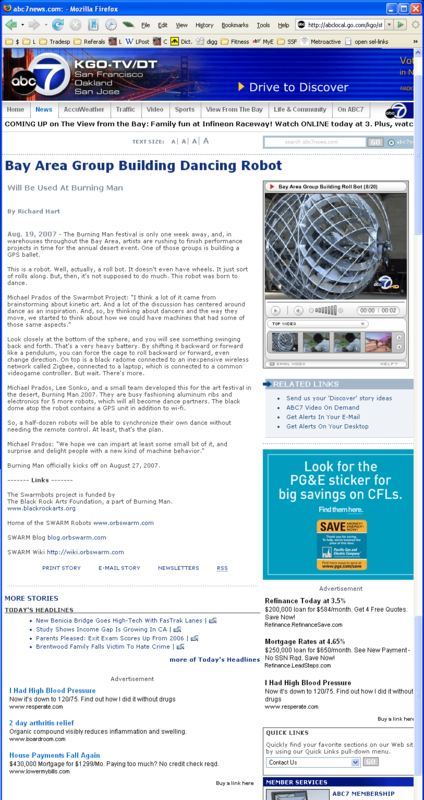 Aug. 19, 2007 – The Burning Man festival is only one week away, and, in warehouses throughout the Bay Area, artists are rushing to finish performance projects in time for the annual desert event. One of those groups is building a GPS ballet. Look closely at the bottom of the sphere, and you will see something swinging back and forth. That’s a very heavy battery. By shifting it backward or forward like a pendulum, you can force the cage to roll backward or forward, even change direction. On top is a black radome connected to an inexpensive wireless network called Zigbee, connected to a laptop, which is connected to a common videogame controller. But wait. There’s more. Michael Prados, Lee Sonko, and a small team developed this for the art festival in the desert, Burning Man 2007. They are busy fashioning aluminum ribs and electronics for 5 more robots, which will all become dance partners. The black dome atop the robot contains a GPS unit in addition to wi-fi. So, a half-dozen robots will be able to synchronize their own dance without needing the remote control. At least, that’s the plan. Burning Man officially kicks off on August 27, 2007. The Black Rock Arts Foundation, a part of Burning Man. Huzzah! How’d you fab those hoopy spheres, man? I hope you film the experience at burning man! I’d love to see! I could (in my mind) see it expand and contract … and that part of the idea makes me think of http://www.greenfusefilms.com origami folding. >How’d you fab those hoopy spheres, man? Solidworks, 1/8″ aluminum, water jet cutter, jig, TIG welding..
We’re hoping to enter an art contest with a video… so yes!